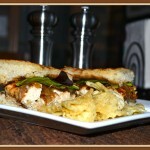 Lemon Pepper Chicken Panini - What the "Forks" for Dinner? Lemon Pepper Chicken Panini - What the "Forks" for Dinner? Mix all ingredients in a small saucepan. Bring to a boil. Reduce heat and simmer until reduced to a syrupy consistency. Let cool.